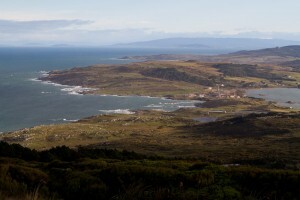 The southern tip of the south island of New Zealand with Stewart Island far in the distance. We were up bright and early this morning to catch the morning ferry back to the south island and meet up with the rest of the bus. The ride back from Stewart Island wasn’t as bad as the previous day’s trip, but I’m not sure that passage is ever calm. If you plan on getting to Stewart Island by ferry, do yourself a favor and take some motion sickness pills before you go, just to be safe. A sea lion that was bathing in the warm sun at Waipapa point. Today was another day of south island scenery; only instead of mountains we made a number of stops along the southern coast. 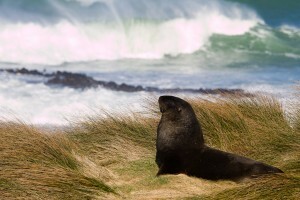 One notable stop was Waipapa point where we walked down to a lighthouse and were greeted by a sea lion. While it was still a bit chilly, the warm sun was a nice change from the snow storm that prevented us from reaching Milford two days earlier. A bit further down the road we made other stops to check out some petrified forests, grab some milkshakes by a bay and saw a couple waterfalls a short walk from the road. 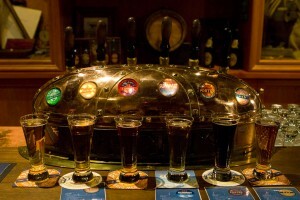 We ended our day in the city of Dunedin, who main draw for the Stray bus is the Speight’s Brewery Tour. 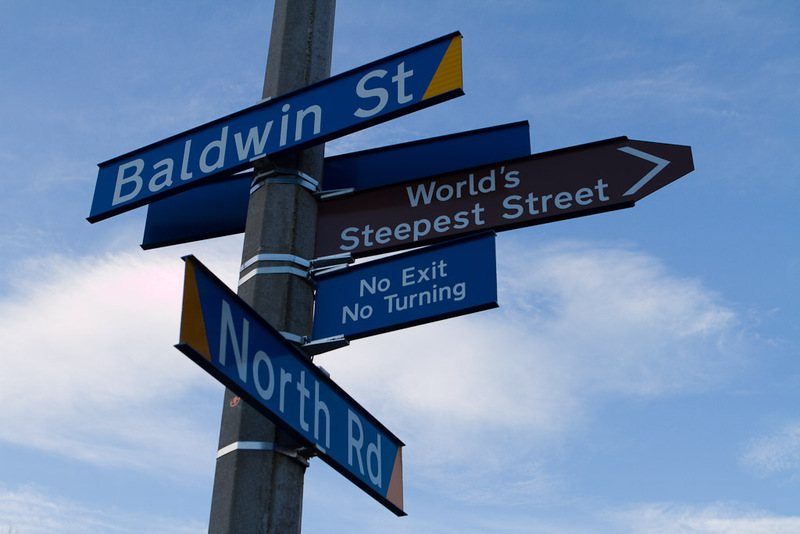 However, before we checked in and headed down to the Brewery, we hiked up and down Baldwin Street, the “world’s steepest street”. The sign post at the bottom of Baldwin Street, world's steepest street. On a bit of a tangent, one of the things I found fascinating about the Stray trip so far is the number of kitschy tourist attractions we passed along the way. A giant carrot, a giant gumboot and giant stone fruits are just a few of the things we passed before hiking what they claim to be the steepest road in the world. They remind me of how towns in the United States do very similar things to try and draw tourist traffic. After our little jaunt up and down the street, we checked into the hostel and quickly made our way over to the brewery for the last tour of the day. The tour itself is okay, all things considered, but the guide certainly knows what he’s talking about and the information I found worthy of note was how the brewery was owned by a major Japanese company and that they’d been brewing many brands outside the Speights label. The items on the menu in the tasting room of the Speight's Brewery Tour. 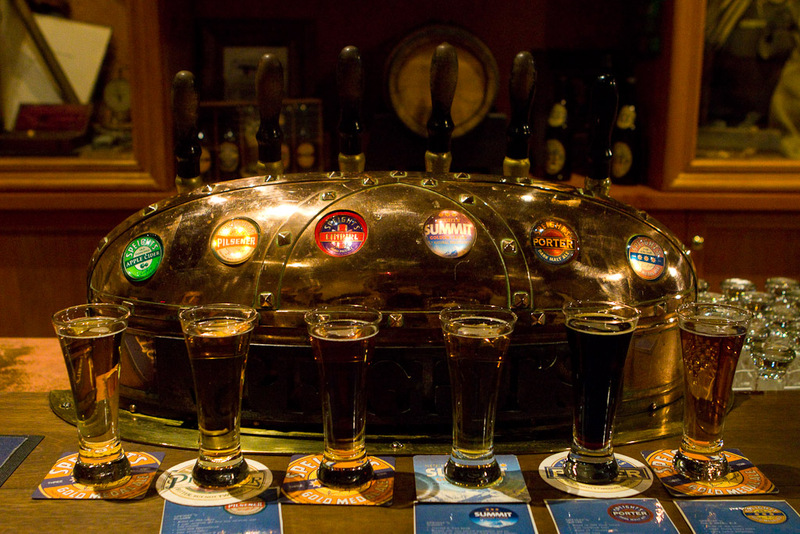 Of course, the reason the tour is high on the list of things to do is the time you get in the tasting room after the tour is completed. You’ve only got about 30 minutes, but it shouldn’t be surprising how much a bus full of travelers in a room with free beer can put away. After the tasting room, most of us went next door to the attached restaurant for dinner and then scattered a bit, some to head back to the hostel and others to continue drinking the night away.